We usually cruise the Caribbean because the East Coast ports are close to us. For our 25th anniversary we decided to return to Hawaii where we spent our honeymoon. The last time we were there, we were constantly packing and unpacking for each island, so a cruise was a logical choice to avoid that. The Pride of America is a smaller ship, but we like that. 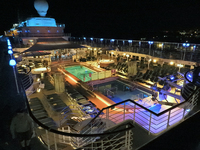 We don&apos;t gamble, so no on-board casino doesn&apos;t bother us. As non-smokers, we also like the fact that there&apos;s only one place on the entire ship for smokers - on the 13th deck all the way aft. A major storm was passing through the islands, so when we got on board, we were told that the itinerary was reversed and we would go to Kauai first instead of Maui. Any pre-booked Maui tours were automatically refunded, and we were still able to get the same Kauai excursion. After visiting Kauai and the big island, we were still unable to stop at Maui for 2 days due to dangerous wind and waves. The crew apologized many times, and did everything they could to arrange activities for the 2 additional sea days. They even reprinted the Freestyle Daily with new activities and made sure everyone got a copy. Instead of port calls, we sailed along the Molokai sea cliffs, did some whale watching, and cruised around the islands. We heard some passengers complaining about not getting to see Maui, but it isn&apos;t NCL&apos;s fault that the weather was bad. After all, February is the coldest and wettest month in the state, so you have to expect something other than sunshine. We took lemons and made lemonade and had a great time. We had a lot of relaxation time. We found the crew to be very friendly, and even had two dining room waiters look us up and say hello whenever we weren&apos;t seated in their section. Since it&apos;s a U.S. flagged ship, much of the crew consisted of college age kids from many states. There were also folks from Guam - a U.S. possession. 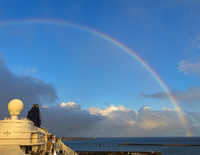 One of many rainbows seen from the ship every day. We usually cruise the Caribbean because the East Coast ports are close to us. For our 25th anniversary we decided to return to Hawaii where we spent our honeymoon. The last time we were there, we were constantly packing and unpacking for each island, so a cruise was a logical choice to avoid that. The Pride of America is a smaller ship, but we like that. We don&apos;t gamble, so no on-board casino doesn&apos;t bother us. As non-smokers, we also like the fact that there&apos;s only one place on the entire ship for smokers - on the 13th deck all the way aft. A major storm was passing through the islands, so when we got on board, we were told that the itinerary was reversed and we would go to Kauai first instead of Maui. Any pre-booked Maui tours were automatically refunded, and we were still able to get the same Kauai excursion. After visiting Kauai and the big island, we were still unable to stop at Maui for 2 days due to dangerous wind and waves. The crew apologized many times, and did everything they could to arrange activities for the 2 additional sea days. They even reprinted the Freestyle Daily with new activities and made sure everyone got a copy. Instead of port calls, we sailed along the Molokai sea cliffs, did some whale watching, and cruised around the islands. We heard some passengers complaining about not getting to see Maui, but it isn&apos;t NCL&apos;s fault that the weather was bad. After all, February is the coldest and wettest month in the state, so you have to expect something other than sunshine. We took lemons and made lemonade and had a great time. We had a lot of relaxation time. We found the crew to be very friendly, and even had two dining room waiters look us up and say hello whenever we weren&apos;t seated in their section. Since it&apos;s a U.S. flagged ship, much of the crew consisted of college age kids from many states. There were also folks from Guam - a U.S. possession. It was a little tight getting between the wall and the bed, and the balcony was on the small side, with enough room for the chairs, but not enough to put the foot rests out. The bed was very comfortable. You must be careful of the balcony door latch though. It only works from the inside and if you&apos;re underway and the ship is rolling, the door can slide closed and you&apos;re stuck outside. Luckily, my wife was inside when this happened to me. The port is in the industrial area, so you must take a taxi to go anywhere. If you rent a car, there are free shuttles for each company, but it&apos;s VERY advisable to book prior to the port call, since there will be many people waiting for a ride and they take those with reservations first. All of the car rental places are at the airport, which is a quick 10 minutes away by shuttle. The shuttles run all day, about every 20 minutes. 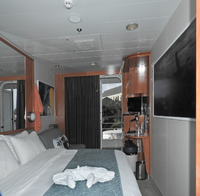 We took NCL&apos;s "Journey to Waimea Canyon" tour. it was 5 hours and most of it is in a tour bus. we mad one rest stop at a country store where souvenirs, snacks and clean rest rooms are available. USE THEM! There are public rest rooms at the canyon but they are miserable. We were warned that they would be nasty, and they are correct. our guide was Leonard and he talked the entire time; cracking lame jokes, but also giving a lot of background history and information about the islands. The price wasn&apos;t bad considering what we got. It would have cost as much money to rent a car and we wouldn&apos;t have been able to enjoy the scenery or gotten the back story on what we passed. We had to tender in from the ship, but the landing is right downtown, so no shuttle or rental car is needed to experience Kona itself. It&apos;s a pretty compact town and there are many great restaurants and you can book your own tours from several activity center booths.